If you enjoy the benefits of a sport utility (some sport, some utility) then you'll enjoy the ownership experience of an Element. With a wide-open interior housed within a very small footprint, the Element is perfect for getting out of town - and beautiful for maneuvering in town as you head out. Add an affordable entry point, great resale value and economy of operation, and you have a very sensible choice. So much room in the car!! My favorite aspect of the car is the huge amount of space available. You can take the seats out or fold them onto the sides of the car to give more room, which makes it great for hauling stuff. It was a lifesaver when moving to go to university. One downside for me is the suicide doors. They are not awful, but they can be a bit of an annoyance, especially when I'm trying to drop someone off in the back, and the front door has to be opened in order for the people in the back to be able to exit the vehicle. Overall though, it's a very comfortable car, with pretty decent gas mileage. I would definitely recommend it to someone, even though they stopped making new versions. Definitely worth it to get a used one. I love the Honda element, overall engine size is good, heat and air are basic, stereo is undersized and needed an upgrade. Seats are missing the captain's chair arms, accessories are becoming increasingly harder to find, ability to fold seats and haul larger objects is the main thing I love about it. Its essentially a covered pick up truck. This is actually my second element, I keep saying its overall about 10% less quality than my original 2003. Doors, suspension, the feeling of driving it is just a bit less in quality overall. I really would hope they would see the value of this market and start making them again. 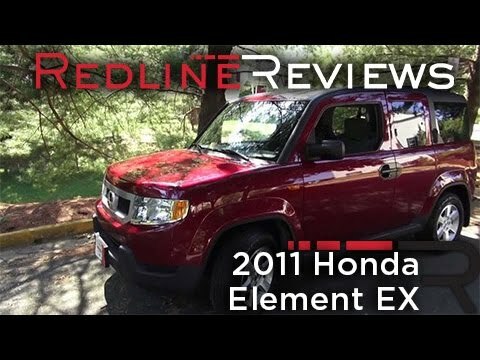 I so wish that Honda hadn't stopped selling the element. I have own two and well over 125,000 miles on the 1st one. It fits so well with my work. I sell antiques and collectables. I need this amazingly super square, with removable back row seats to have the size and space that I need to pick up items that will not for one minute foot into any of the new SUVs. I am heartbroken that this will most likely be my last "best" vehicle for my needs. P.S the Ford transit wheel base is scary small and no 4 wheel drive and the jeeps have poor reliability records.